Philadelphia is a big yet charming city that is often overlooked by neighboring New York and Washington DC. Boasting a rich history, impressive museums, and a vibrant food scene, there’s no shortage of places to explore. For a luxurious stay in a great location, spend the night at the Hotel Monaco. Located in the heart of Old City, this hotel is the perfect base for seeing Independence Hall and Society Hill, exploring Fishtown, and venturing to South Philly. Be sure to check out the rooftop bar and restaurant while you’re there! 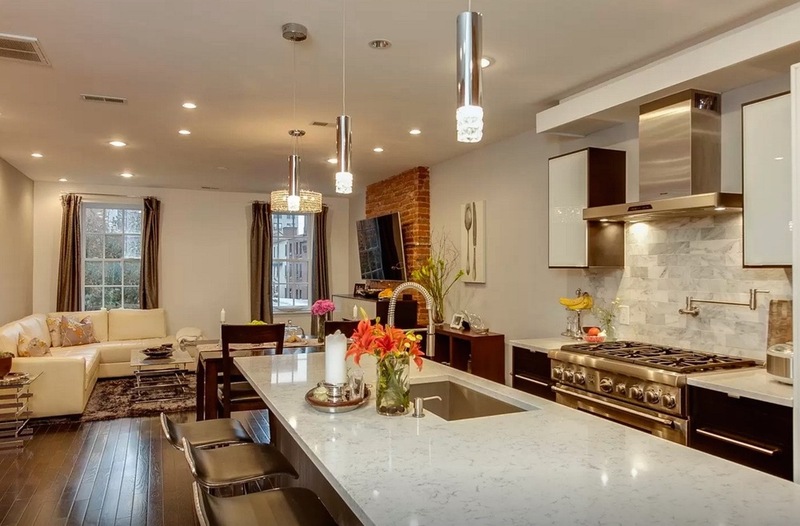 Centrally located between Broad Street and Rittenhouse Square, this apartment is perfect for exploring the shops on Walnut Street, Rittenhouse Square, City Hall, and the Museum District. It is also near Suburban Station and the Broad Street and Market-Frankford Subway lines, making it easy to explore just about anywhere. This loft-style apartment is the perfect place for a large group. It’s located in Fishtown, which is filled with great restaurants and bars, and is just a short subway ride to Center City. Stay here to enjoy the Philly vibe without the crowds! Located in Philadelphia’s famed museum district, the Barnes Foundation stands out for both its impressive artwork and its inviting atmosphere. Wander through its many rooms and you’ll find an exceptional collection of impressionist art that contrasts the contemporary design of the building. Be sure to also check out the new Picasso exhibit, which runs through May 9th. Old City, birthplace of the Declaration of Independence and former home of the Continental Congress, is extremely touristy, but for good reason. Walking around the cobblestone streets, surrounded by charming historic buildings and alleys that are among the oldest in America, it is hard not to feel a sense of awe and inspiration. If on a limited schedule, I would recommend skipping the guided tours and instead exploring the area at your own pace. You may even stumble upon some of the area's beautiful hidden gardens. Just south of Independence Hall, Old City becomes Society Hill, which is in my opinion even more charming. Colonial flags flying over narrow tree-lined streets makes this area one of Philly’s most picturesque. I love getting lost around here- especially in the fall or in the rain- and I always discover something new. Adjacent to the Philadelphia Museum of Art lies the Schuylkill River Trail, which was recently named the best urban trail in America. The trail provides great views of the skyline, Art Museum, and the boathouses of Kelly Drive (known as boathouse row), and is a perfect place for walking, running, or biking. I like going on the trail early in the morning, when the crowds are thin and the city is just coming to life, but it provides a relaxing break from the crowded streets at anytime. In addition to providing a scenic connection between the Art Museum District and Center City, the trail provides easy access 30th Street Station and University City via several bridges. For an authentic Philadelphia experience, head to the open-air Italian Market, located across a four-block stretch of 9th street in South Philadelphia. Here, you can get your fix of fresh cheeses, pasta, fruits, vegetables, and of course some top-notch sandwiches. Di Bruno Brothers original Italian Market location is a Philly classic, and a perfect place to learn about (and of course sample) every cheese imaginable. For a great selection of unique sandwiches, try Paesanos. And once you’re done eating, the Italian Market is a perfect base from which to explore South Philadelphia. If you are looking to do something unusual check out The Magic Garden on South Street. The garden consists of a maze of mosaic pathways and walls that took over ten years to complete. Be sure to keep your eyes peeled for the phrases some of the tiles spell out! Sushi and coffee are two of our vices, so Double Knot is a perfect combination! At first glance, Double Knot seems like a typical trendy coffee shop. But don’t be fooled. At night, the coffee shop turns into a bar, and the hidden downstairs restaurant becomes a delicious sushi bar and Robatayaki Grill, with amazing classic rolls and inventive dishes such as edamame dumplings and black garlic wings. The Good King Tavern boasts a relaxed atmosphere, delicious drinks, and excellent no frills French food. Whether you are trying to impress your new date or looking to catch up with friends Good King Tavern is the perfect spot to start your night. Book your table well in advance because space fills up quick. For brunch, skip the long waits and head to this French-Lebanese gem that is by far the best brunch in Philly! I’ve only tried a few things on the menu (due to the Huevos Rancheros being so amazing) but I guarantee that nothing they make is anything less than perfect. In addition to their food, the strong coffee and fresh orange juice, paired with friendly and attentive service, are the perfect way to start the weekend! Head to this classic Philly dive bar to experience the Philly special- a shot of whiskey and a PBR- firsthand. And be sure to check out the Pabst memorabilia while you’re there! Venture to Port Richmond for some of the best pizza in Philadelphia. This local, family-style restaurant serves a delicious thin pie, which can be made with no sauce, regular, or white with your choice of toppings. My favorites are regular sausage and peppers or white with spinach and tomatoes. Just be sure to call the night before to reserve your dough in advance! McNally’s was founded in 1921 and has served some of the best food in the Philadelphia area ever since. To get there you’ll need to drive or take the train about 30 minutes from Center City, which is well worth it for what in my opinion is the best sandwich in Philly! Sit at the bar, relax, and order a Schmitter and bowl of turkey chili for an extremely memorable meal. Another Philly classic- often overlooked due to cheesesteaks, is the Roast Pork Sandwich. Head to Tommy Dinic’s- located within Reading Terminal Market- or John’s Roast Pork for delicious shredded pork served on a fresh roll with sharp provolone and broccoli rabe. This spot on restaurant-heavy 13th street makes amazingly light and refreshing gelato that I imagine can only be topped in Italy itself. Try any of their mix of classic and unique flavors. My favorite combination is the cappuccino or coffee flavor paired with a lighter option such as kiwi or lemon. Although Philadelphia may not offer the juice bar options of, say, New York, Sip-N-Glo provides everything you could need. Try their monthly smoothie specials- currently The Great Pumpkin and Pearfection- or the delicious Honeylove, which is always on tap. And while I still haven’t tried their juices, I have no doubt they are tasty and refreshing as well. There are endless quality options in Philadelphia’s Chinatown, and Dim Sum Garden is a consistent classic. The Shanghai Steamed Pork Soup Dumplings are my favorite, and their other dumpling offerings are equally awesome. If you feel like exploring their menu of larger dishes, the Sliced Pork in Garlic Sauce is delicious , as is their Beef with Broccoli. Walking is the best way to explore, as the city is very accessible. If you need to go a little further, Uber’s and cabs are also readily available. To get to McNally’s, take the Chestnut Hill West line on Septa regional rail from one of center city’s three stations, and get off at the last stop. To get to Center City from Fishtown, simply hop on the Market-Frankford “el” line towards 69th Street Terminal.